The Strange Story Of 'Convoy': How A Trucker's Protest Anthem Became A '70s Hit "Convoy," a 1976 novelty song attributed to C.W. McCall, topped the charts with its celebration of citizens band radio, trucker lingo and rugged individualism. 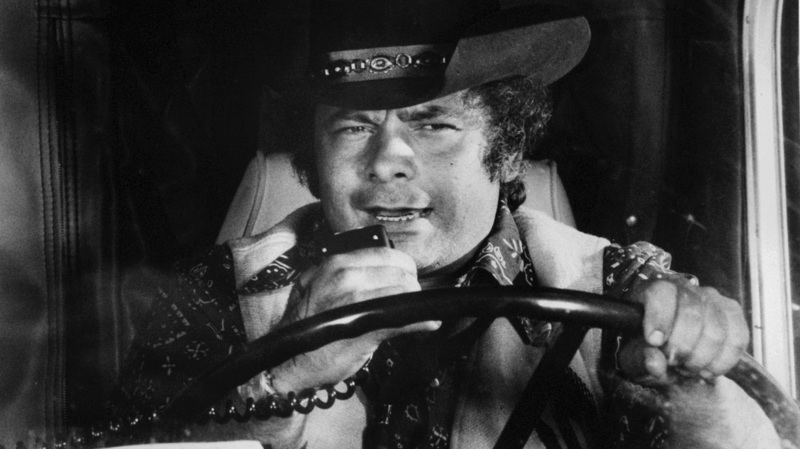 Burt Young shouts into his CB radio in a scene from the 1978 film Convoy, which was inspired by C.W. McCall's hit song of the same name. There's armored cars and Interstate tanks and jeeps and rigs of every size. Yeah, them chicken coops was full of bears and choppers filled the skies. And 11 long-haired Friends of Jesus in a chartreuse microbus. To make sense of "Convoy," consider what was happening in 1976. The United States was still reeling from a gas crisis. Motorists had to wait in line for hours to get fuel, prices skyrocketed and the federal government imposed a nationwide 55 mph speed limit. The economy was in bad shape, and the trucking industry was hit hard. Enter citizens band (CB) radio. Truckers used it to communicate, help each other on the job, forge camaraderie and even keep one another awake on long hauls. But when the FCC eliminated the need for an operator's license to use a CB radio, suddenly anyone could listen in and join the conversation. Fries did just that, learning the code words truckers used and weaving them into lyrics: "Swindle sheets" are logbooks, "chicken coops" are weigh stations, and "bears" are police. The narrator of "Convoy," a driver who goes by the handle The Rubber Duck, uses the CB to lead a group of truckers in protest of government regulations. As they move across the country, the excitement builds. Law enforcement tries to intervene, but in a grand act of unity and resistance, more truckers and other motorists join the convoy, making them unstoppable. Even though "Convoy" is sung by a fictional character and its story is fantastic, Fries' use of trucker lingo resonated throughout popular culture — by the end of the 1970s, millions of Americans had used a CB radio. Sure, "Convoy" is a novelty song, but it topped the pop and country charts and became a phenomenon, inspiring movies and TV shows. It's also an improbable protest song — an asphalt fable of workers pushing back at a system that always seems to lean on them the hardest.